After I finish this post, I'm headed to pick up a bag of veggies from our CSA. And yes, I will be driving a Subaru. And listening to NPR. And thinking about The Wire, which I am finally getting around to watching. So...... one of the items in this week's batch is kohlrabi. When we started getting this cabbageish curiosity, I first had to first figure out how to pronounce kōl-ˈrä-bē. Then I had to figure out some way to consume it. Bonus points if the kids would eat it too. 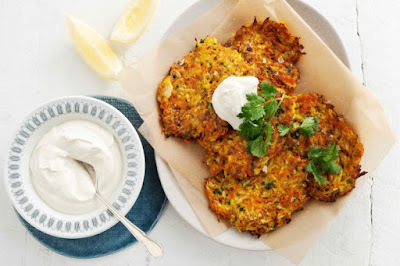 Fortunately, Dr. Google had the right answer: Kohlrabi Fritters. Basically, you shred up the kohlrabi, mix it with a bunch of stuff, and FRY THE HELL OUT OF IT! That's a winning formula for any vegetable--except okra. Sorry southern friends, but okra is the snot of the vegetable universe. I don't know how you eat it. I don't know why you eat it. But you are objectively wrong for making fried okra look appetizing on buffet lines. Are the kids diving in on fritter madness? Kinda. Sorta. Not really. But close enough. So we keep making them. If you find yourself with a surplus of kohlrabi, go ahead and give this one a whirl. The recipe includes an accompanying yogurt sauce that is quick and easy. I think I'll be adding roasted garlic scapes to the menu this evening. Because that's how I roll... in my Subaru... which doesn't stop for okra.